Makita already makes some of the best stock blades in the business. They’re one of the few that our Pro team doesn’t immediately swap out when a new saw arrives. When I saw the new Makita Max Efficiency Circular Saw Blade, there was no question I wanted to bring it in for some testing. I love the speed and efficiency improvements that I’m getting from the Makita Max Efficiency Circular Saw Blade, but I can’t ignore the wandering on tougher rip cuts. I really like this blade as the primary for a cordless circular saw that you’re going to be making cross cuts and ripping sheet goods with. I’ll stick with a slightly thicker blade for worm drive work. To test the Makita Max Efficiency Circular Saw Blade, I set up lab tests in the shop and sent a few blades out to our Pros in the field for some real-world feedback to go along with my results. I used the blade in multiple saws, including Makita’s new 18V X2 (XSH06) and against 3 other competitors on full-depth rip cuts in pressure-treated 4×4 pine. What our contractors reported back is the same thing that we experienced in our testing – the Makita Max Efficiency Circular Saw Blade does cut faster and more efficiently. They also noted that on tougher rip cuts, the blade tends to wander a bit. It’s something to keep in mind when you’re deciding what saw to pair the blade with, though. The coating stays on impressively well. After nearly 100 cuts, the coating is in better shape than Diablo’s after close to 70. 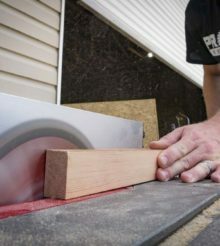 How would these blades work in the M18 7 1/4 miter saw?